We have the smart and safe solutions of racking for your van. 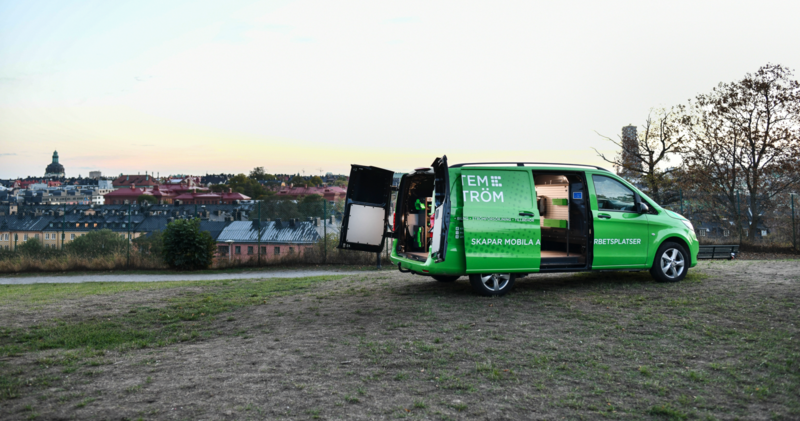 System Edström creates mobile workplaces! 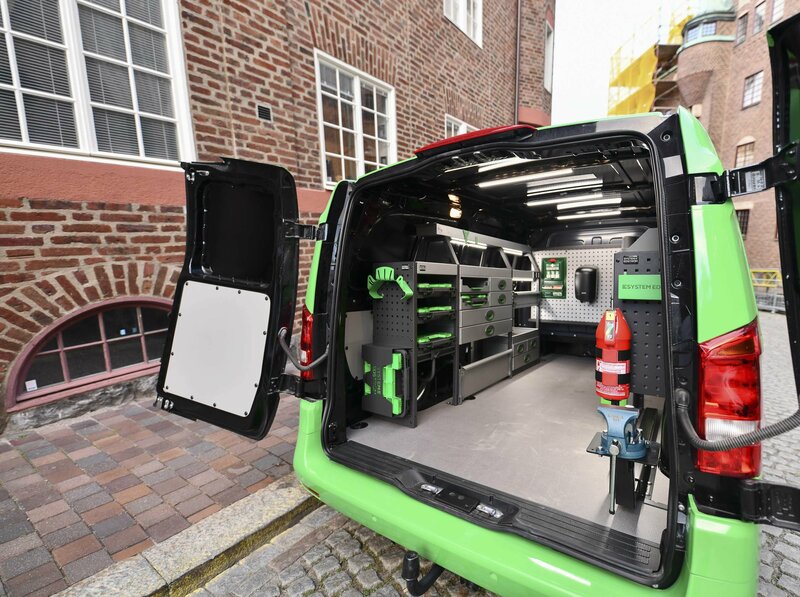 See how your van racking would look like in your van by exploring our products in 3D format. Build you own van racking or choose one of our proposals. 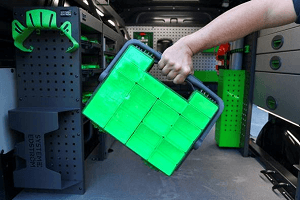 When you have a professional van racking system in your service van, you will discover how much more efficient and fun work can be. By keeping your tools and equipment well organized, opening the doors of your vehicle to start work will be a joy. Your customers will also see a professional craftsman who does not need to spend more time in his vehicle than necessary. Avoid needless searches for tools and equipment and simply start work. We are a market leader in equipping mobile workplaces. We do this by focusing on offering the utmost in safety, quality and flexibility. We custom design our van racking systems to suit your particular needs. Add quality work lighting to your service vehicle. You should consider equipping your vehicle with good work lighting for better safety and a better work environment. We offer both exterior and interior lighting. We always put safety first so that is why we subject our van racking systems to crash tests in accordance with international standards and independent, approved testing institutes. These tests are extreme and require high speeds and heavy loads. Depending on your vehicle’s requirements, we will assist you in finding the best possible power supply solution. We offer several different types of inverters; one of most popular is our 400 W inverter. Even if our van racking systems help you keep you vehicle organized, sometimes you need special accessories for that little extra. We offer a range of different accessories to make your day a little easier. With more than 60 years in the business we are van racking experts. All our product development and manufacturing is handled in Sweden. As a result, we only have short distances to travel which helps reduce the impact on the environment. We also offer 3-5 year warranty if you purchase and install your van racking system at one of our many dealers throughout Europe. We crash test all our van interiors according to international standards. These tests are tough and are carried out by independent testing institutes in France. They have developed extreme testing methods involving ultra high speeds and heavy loads. System Edström has become the market leader on the Swedish and Nordic markets and also sells van racking systems throughout most of the European market thanks largely to a cutting-edge approach in terms of sales and product development. 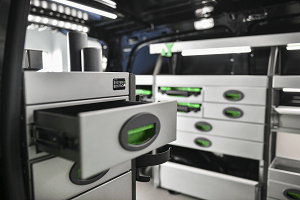 Our van racking systems are designed for flexibility and simplicity, making it easy for our customers to find the right system for their vehicles and be able to install it. If you mounting the van racking system yourself, we provide general mounting instructions and we give you a three-year warranty on the fittings. 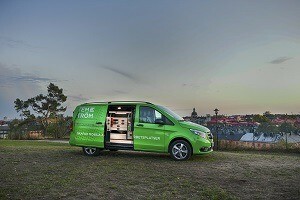 Safety is one of System Edström’s most important areas of concern when it comes to van racking in transport vehicles. In the event of an accident, your vehicle’s interior must offer safety so that your tools are exactly where you have stored them. The three most recent updates from System Edström.